Barbed wire, guards and roll calls are just some of the things that come to mind when considering life in a First World War internment camp. The men held captive were believed to be a threat to the nation and had to be controlled and confined for the duration of the war. Internment was a life changing experience for the men who were confined behind the barbed wire fences. This theme will explore how the camp developed and the structure or structurelessness that was created through the implementation of routine, restrictions and defined ways of living. Knockaloe Camp was a highly structured space within which movement was strictly controlled. The site was initially designed to hold 5,000 men, providing additional accommodation for the rising numbers of men being interned throughout Britain. With Douglas Camp already functioning on the site of the Cunningham’s Holiday Camp in Douglas the site at Knockaloe was selected on 24 October 1914 by a group of officials from the Civilian Internment Camps Committee who wanted to develop a new camp to relive the considerable pressure on the temporary holding camps set up around the county. Knockaloe Moar farm was selected due to its adequate water supply and its previous use as a campsite for Territorial Army training. Ultimately the camp was to hold at its peak 22,769 men resulting in the camp developing from the initial camp, to a complex of four camps each divided into a series of 5 to 7 compounds designed each designed to accommodate 1,000 men. The construction of Camp 1 was carried out by Douglas builder Mark Carine but the time involved in construction led to the subsequent three camps being built using pre-fabricated standard war issue huts. A suitable infrastructure was developed with sewerage system, drainage and water supply while a branch line of the Islands rail network ran from Peel harbour to the camp to facilitate the delivery of supplies. By the time it was complete the camp had used 15,000,000 feet of timber, 1,000,000 bricks and 695 miles of barbed wire to surround the camp. 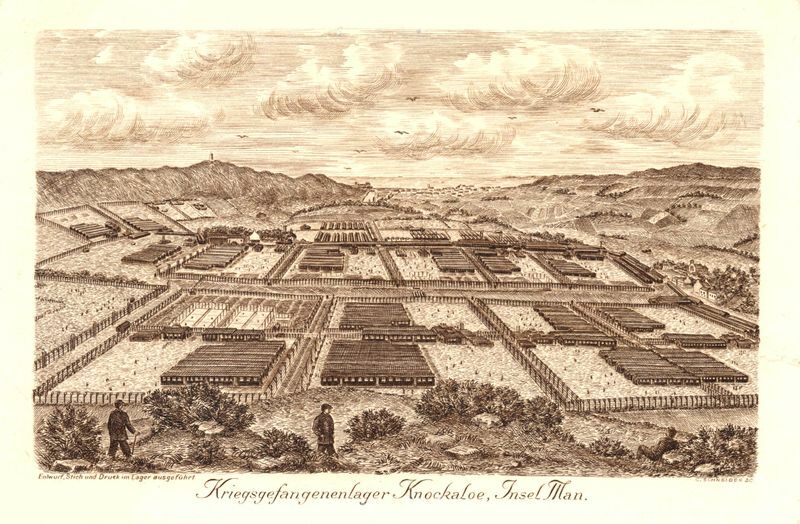 Initially placement in Knockaloe’s camps was arbitrary with each new group of arrivals being placed in the next available accommodation. 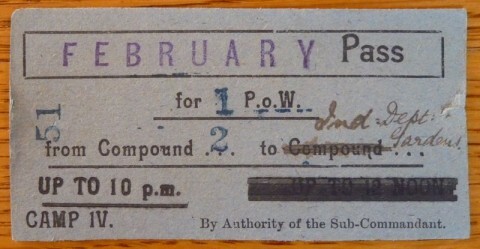 With time this changed as Camp 4 was developed as a ‘privilege camp’, available to those who could afford to pay a monthly fee of 11 shillings. In return they were provided with a better quality of accommodation. In 1917 the decision was made to separate the younger men and they were moved to Camp 4, Compound 7. This was later deemed a failure and the following year the young men were returned to their original compounds. Within an environment such as this the internees had to learn to deal with the restrictions it involved. By default such a system treated the internees as a collective entity in terms of the general running of daily life. Men were expected to attend role call together, eat at the same time and rules and regulations applied to every individual. Communal living took away much personal freedom. Accommodation in the huts was open plan while the large number of men in each compound made it difficult for anyone to find a space where they could be physically alone. Such large numbers of people would also have resulted in high levels of noise, restricting privacy on a multisensory level. Although movement within a compound was relatively free during the daytime, movement at night was restricted and anyone who did leave their hut would be seen by guards who kept a 24 hour with the camp floodlit at night. Movement between compounds was even more strictly controlled with internees having to justify their need to enter another compound and obtain a pass to do so. All images © Knockaloe Archive.